Cairo, Egypt -The hazy desert that extends from the outskirts of Cairo has become the unlikely scene of another revolution that has the potential to transform Egypt - and it is green. Inhospitable, yellowed wasteland is now yielding up ripe red tomatoes, fresh kale and schools of fish in a bold experiment fuelled by the country's most precious resource: water. This surprising harvest illustrates how Egypt is witnessing a slow transformation in attitudes towards the environment driven by groups such as Greenpeace and Nawaya alongside an innovative young sustainability movement. In the vanguard of this movement is Faris Farrag, an Egyptian banker inspired by a love of growing plants and fishing, who has embraced the revolutionary technique of aquaponics at his unassuming farm outside Cairo called "Bustan" (Arabic for orchard). "As the price of water soars, as the price of petrol soars, and when the subsidies on farming disappear, this model makes sense," says Farrag. 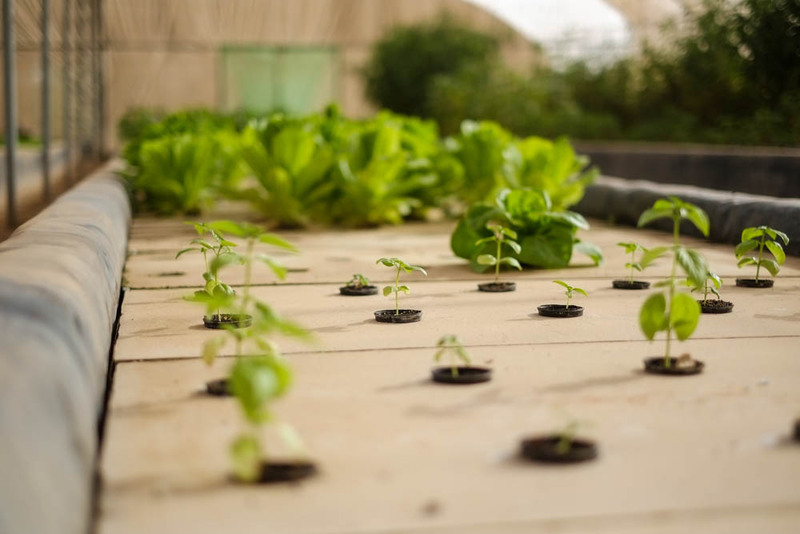 Aquaponics, an ancient form of cultivation that originated with the Aztecs, enables farmers to increase yields by growing plants and farming fish in the same closed freshwater system. Farrag studied the technique under Dr James Rakocy at the University of the Virgin Islands, whose sustainable farming method grew in popularity in the 1980s and is now gaining mainstream acceptance in developing nations. Enterprising farmers have implemented the system in countries as diverse as Bangladesh, the United Arab Emirates and Yemen to save water and increase output. At Bustan, the first commercial aquaponics farm in Egypt, olive trees flank the growing areas sprouting from what seems to be sandy ground, and dusty mesh screens are the only barriers protecting delicate young plants from the expansive tracts of sand. Water circulates from tanks hosting schools of fleshy Nile tilapia through hydroponic trays which grow vegetables including cucumber, basil, lettuce, kale, peppers and tomatoes on floating foam beds with run-off flushed out to irrigate the trees. It is an ingenious solution to an old problem in a country dominated by unforgiving deserts where access to fresh water is a luxury in many areas. The Nile supplies Egypt with almost all its water, 85 percent of which goes to agriculture - but the country has long outgrown agreements with neighbours on its share of this resource as its population has soared to 85 million, and is pressing to renegotiate terms. Earlier this year the most populous Arab nation made global headlines in an angry disagreement over plans to dam the Blue Nile, denouncing Ethiopia's attempts to reroute the river. Compounding problems of access to water is pollution, and visitors only have to peer at the Nile's swirling eddies and water catchments to notice the gunk and assorted rubbish that confirm the low priority afforded environmentalism. Most of the population lives on the 2.9 percent of land that is arable and use the only source of fresh water as an industrial, human and agricultural dump, undeterred by laws that prohibit the throwing of waste into the Nile. Compounding water pollution, Egypt's annual "black cloud" caused by the burning of agricultural waste costs an estimated $6bn in damage to natural resources and a further $2bn in associated health effects, according to date compiled by the American University in Cairo. These challenges are a bleak reminder of how desperately Egypt needs environmental policies to protect its fragile agricultural resources. From Cairo's unremitting expansion into fertile areas to the mountains of garbage strewn on the city's streets, incessant congestion, and misuse of the water supply, there are precious few examples of sustainability. Which is where Farrag believes aquaponics comes in - Bustan uses 90 percent less water than traditional farming methods in Egypt. He argues that his model is economically viable and scalable, producing between 6-8 tonnes of fish per year and potentially yielding 45,000 heads of lettuce if it were to grow just a single type of vegetable. Sustainability underpins the whole operation, he says. Bustan is not land-intensive and Farrag also uses biological pest control methods, such as ladybirds to kill aphids, in order to avoid chemical inputs. The project also employs two locals, Abdul Rasul Hassanain and his wife Amal, who live on a nearby plot of land and have dramatically increased their role in running the farm. Dr Ashraf Ghanem, a professor of water engineering at Cairo University, is a strong advocate of the system. He recently told journalists about the potential benefits of these farms in the Middle East, saying they: "Could serve as a means of income generation for unemployed women, as well as a means of education for children of the household on principles of water saving, plant and fish biology, nutrient cycle, fluid mechanics, hydraulics, microbiology and renewable energies." A local non-governmental organisation, Nawaya, is taking a leading role in supporting sustainable farming and has brought locals to visit Farrag's farm in a bid to help them swap traditional irrigation techniques for sustainable methods. But that transition does not come cheap. 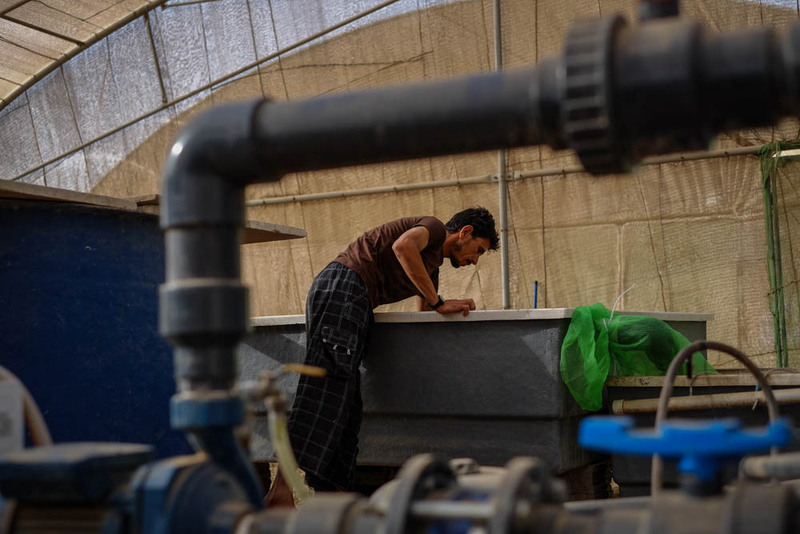 Inside Bustan, the hum of pumps to ensure the fish are raised in pools with properly filtered water is constant, raising concerns about costs - and posing questions about whether sustainable farming can only be a novelty for the wealthy. Farrag has invested more than 300,000 Egyptian pounds ($43,500) in his dream over the last two years - a daunting sum compared to the modest incomes of most rural Egyptians. But the green entrepreneur is quick to point out that the project could be set up with half that sum, and notes that Bustan was built with locally sourced construction material. "This is all Egyptian made or stuff that's easy to find in Egypt. Anyone could do it," he says. With the late afternoon sun hanging low in the sky and the desert wind brushing over olive branches, the hangar-like structure of the farm rests like an oasis. "The beauty of this system is that you can go to a piece of land that is non-plantable, that is not viable for agriculture, because you build the system"” adds Farrag. "You can take a rock and build on it. And then you have tomatoes and fish in the desert."